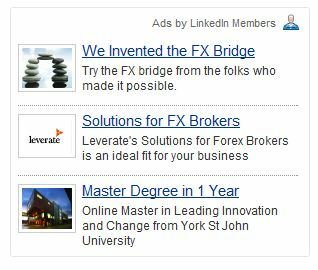 Lately I’m noticing an increased usage of Linkedin as an advertising channel by forex software firms (and many others). It’s an interesting marketing channel no doubt. Whereas Google and the likes are a fantastic marketing tool for the retail end-user, channels like Linkedin are catering to the executive crowd and are rare. Specifically in forex, software companies and other providers are struggling to reach their target audience of forex C-level executives. There are only a few attractive channels – Forex Magnates is certainly one of them, e-forex is another but only lately Linkedin has become popular as well. Linkedin is a rapidly growing business network and almost every executive is registered there so reaching them isn’t that difficult. Unfortunately for Linkedin their advertising platform is far from being perfect as advertising is not as targeted as it could be. I’m sure it’s going to improve soon. In general I think that Linkedin, having improved the targeting and keywords, should become a fantastic business advertising tool as people write in what companies they work, what is their experience, position, interest and more. Unlike Google, on Linkedin you have quite a complete profile of the user and they are anything but anonymous therefore you can pinpoint your contacts and the target audience, saving time and money, while reaching only who you want. This is as close to personal advertising as possible. Linkedin prices per click are attractive (few dollars per click) and only few industry specific sites can rival it for the quality of leads. There are a multitude of reasons we use LinkedIn. I’ve been using social media for over a decade now (http://www.mdurwin.com/about). Each channel offers different opportunities. In my past experience in advertising I’ve worked with YouTube, MySpace, Facebook, Twitter, etc. for companies ranging from Decathlon Sports to Liberty Mutual, Reebok to Vermont Teddy Bear. Some channels provide high-priced options such as road blocks, ads, apps, etc. while others offer more guerilla opportunities like branded pages, seeding, etc. LinkedIn became our prime advertising spot because of its ability to highly target a qualified audience. We can actually focus our ads on those interested in FOREX rather than waste our money and the time of people who have no interest in trading. LinkedIn allows you to set a budget for your ads, turn them on or off as needed, target based on gender, HHI, geographic location (great in a highly regulated vertical) down to the city, company, industry, even group membership. Now, LinkedIn only has 100 million registered users, a fraction of what Facebook has. However, even though we do have an active presence on Facebook, it’s much less of an advertising opportunity because it’s far more difficult to target a qualified audience. Mass marketing is a waste of time and money in my mind. You throw away money on people who have no interest in your product or industry. 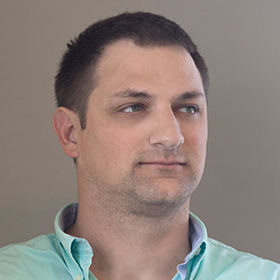 Targeted messaging is a far better use of marketing dollars. Facebook is an instance of mass marketing. It is a very consumer heavy space, but a personal one, not a professional one. Certainly not a place where our audience is easy to reach, or where they’d care to be reached. Twitter is also a channel in which we have an active presence. Twitter has worked great for me personally and great of clients I’ve worked with but it doesn’t work well for our audience. The FX awareness on Twitter is very low. There are a lot of people using it but not in a way that has been shown time and time again to work best. There are a great number of spam bots, duplicate accounts, an hawking going on through Twitter. It’s not a very mature channel for foreign exchange. LinkedIn and Facebook were tied as referring sites for bostontechnologies.com until we launched ads on LI. Once ads were launch LI visits were 3x our FB visits. Unique LinkedIn referrals visited twice as many pages on our site and spent twice as much time there. Twitter visitors spent the most time on our site (by a lot) and the most page visits. Twitter users represented the least amount of actual traffic referral. This knowledge, combined with the ability to tightly focus our campaign and control our budget led us to launch ads on LinkedIn first. The results were dramatic: our hits from LinkedIn tripled. LinkedIn won’t necessarily remain our Go To strategy because user behavior, our business needs, our audience and these sites change all the time. I consider our tactics to be experiments that will continue to evolve. If our traffic begins to increase through Twitter, we may shift more toward that network, the numbers definitely make it possible. Or, something new may pop up. I didn’t make it to SXSW this year but know a few new things launched there. It’ll be interesting to see where we are in the next year. Traditional internet marketing style “free” advertising is also becoming rife in the “FX” groups on LinkedIn, particularly since the majority of those groups are now “open”. I for one don’t much care for all the resulting marketing drivel that has resulted. Maybe you could ask Michael Durwin if he could reveal how effective BT have found that particular sort of advertising to be? Maybe you could also ask him if he’d mind continuing the conversation he started with me over there quite some time ago, but never got around to finishing? I’ve joined into many discussions on LinkedIn, mostly in marketing and advertising forums, on the very rare occasion in Forex groups. I’ll admit, because of the number of groups I belong to I’m not able to keep track of every dangling conversation so I tend to pop in and out as I see email alerts on them. So, I apologize if I left you hanging. As you know, LinkedIn allows you to connect with people with whom you share a group to allow you to continue a conversation if it’s really important to you. As far as sharing stats from our LinkedIn ads, that’s a bit tricky. Sharing our budget, cost option, cost per ad, actual numbers is a bit too revealing to competitors. However, I did write a blog post on the relative impact of LinkedIn, Facebook, and Twitter based in part on Boston Technologies’ presence in these channels. In that post I did mention that I’ve seen some pretty aggressive self promotion, which I’m not a fan of. I think forums, conversation platforms like Twitter are great places to share value in the form of educational content, opinions, etc. The problem I’ve seen is that everyone has a different opinion of what constitutes sharing helpful content and aggressive self-promotion. Some see aggressive self-promotion as “just doing their sales job” some consider it spam. Recently question was posted to a forum in which a couple of my colleagues responded, and were told they were spamming the group. So, it’s a very subjective topic. Members and administrators can be very protective of groups they’ve set up and it’s difficult to tell how one should behave. Each group can take on it’s own culture, it’s important to learn that culture, but not always easy to do. My company has backed out of a particular group because it’s clear that even employees of outside companies are unwanted. I’ve found that many groups on LinkedIn, specifically FX groups are either intended to be strictly traders talking to traders or started by someone eager to the discussions pointed toward them. There is nothing wrong with this, social media is meant to have it’s rules written by it’s users. As for that blog post on LinkedIn stats, it was posted to a LinkedIn group for all to see, as an educational opportunity to help inform those looking to advertise on LinkedIn. You can find it under the title “Real Life Comparison of traffic driven from Twitter, LinkedIn, Facebook, Google.” or you can visit my blog to read it: http://www.mdurwin.com. I hope it’s helpful. Thanks for the additional information. I’ll resend my last email to you then! I got so brassed off with all that “pretty aggressive self promotion” on LinkedIn that I felt compelled to start a closed group of my own, somewhat whimsically entitled “Baby Black Box Trading”. If you or anyone you know is interested in having a sensible discussion about automated trading systems and other interesting stuff without being drowned in spam and/or scams you’re welcome to join me. However I must point out in advance that if our robots’ super sensitive spam scanners (SSSS for short) do detect any aggressive self promotion they will promptly punish the perpetrators (PPP for short).